Why would an acclaimed non-fiction author ‘go over’ to fiction? Perhaps there’s something about the personal meaning of the material for the author that makes it easier to deal with fictionally. Perhaps there are ethical challenges in grappling with it, where the story is based on real-life, still-living people? Perhaps there’s squeamishness about ownership of the story: whether the story is the author’s to tell. 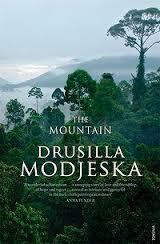 The Mountain is Drusilla Modjeska’s first book of fiction, although none of her work fits neatly into defined categories. Her non-fiction has always straddled the genres of non-fiction, memoir and imagination. In this book, too, I sense that it is not ‘straight’ fiction and I felt almost deceived when reading her acknowledgements at the back of the book that elide the fact that she, herself, was the young wife of an anthropologist in New Guinea in the 1970s. She has made no secret of the fact in her interviews after the writing of the book, and even before, and yet there is this strange distancing of herself from the narrative in her acknowledgements in the book itself. The book opens with a prologue set in 2005. Although called a prologue, it is actually at the chronological fulcrum between Part I, set in 1968-73 and Part II set in 2006. As such, it was largely incomprehensible at first, although I found myself flipping back to it several times while reading the book as the characters became (somewhat) more settled in my own mind. The book closes with an epilogue in 2006 that largely mirrors the opening prologue. Part I, told in the past tense, focuses on Rika, a young Dutch woman who accompanies her older husband, Leonard, an Australian ethnographic film-maker to New Guinea. Set in 1968, she is absorbed easily into a mixed-race, expatriate social milieu gathered around the university. Her husband Leonard goes ‘up the mountain’ to film villages and their inhabitants, and in his absence she falls in love with Aaron, who has come ‘down the mountain’ and is acclaimed as a future leader when Papua New Guinea achieves the independence which is on the horizon. Rika, racked with guilt but also determined in her love for Aaron, travels ‘up the mountain’ to tell Leonard personally of her decision and returns to take up her life with Aaron leaving Leonard heart-broken. However, as time passes and Aaron becomes increasingly caught up in the politics of independence, Rika does not fall pregnant and is thus unable to be fully accepted as Aaron’s wife by the villagers. When five-year-old Jericho is sent down the mountain, Rika realizes that Jericho is actually Leonard’s son by a village woman up the mountain. She adopts him and he too becomes part of this large, mixed-race expatriate community, viewing Rika and her friend Martha as his two mothers. I was engaged by the love story between Rika and Aaron, but found myself bewildered by what seemed like an endless succession of men with biblical names coming ‘up’ and ‘down’ the mountain and their wives. My bewilderment and confusion carried over into Part II when Jericho, now a grown man, returns to PNG in 2006. There had obviously been a rupture: he had been brought up in Oxford where Leonard still lived; he was still in contact with Rika who was now a famous photographer but alienated completely from all contact with PNG and those who still lived there, and Aaron was dead. The hopes and optimism of independence had soured, and the threats of palm oil plantations, mining leases and ecological exploitation were ever-present. I actually managed to read about 50 pages into Part II before realizing that I had confused Aaron and Jacob (there’s those biblical names there) and had to go back to re-read once I realized my error. Inattentive reading on my part, to be sure, but obviously the characters weren’t etched sufficiently into my own reading to survive the time-gap of thirty years between the two sections. Part II is told in the present-tense and it largely revolves around solving the mystery of the rupture between Rika and the expatriate and village communities she had been trying so hard to join. At this level, the book is essentially a story of relationships against a wider political and ethical backdrop. Although the book is fiction and centred on fictional characters, it is very much a book of ideas and it’s the ideas that I take away from the book. There are poetic word-pictures of the beauty of the jungle and the garishness and incongruity of modern development. Betrayal and alienation and being ‘hafkas’ (half-caste), and the multi-layered issues of colonialism and independence, exploitation, superstition and development are all explored with intelligence and nuance. The focus on art and representation evokes Modjeska’s work in Stravinsky’s Lunch, and there are layers upon layers of thought in the book that speak to the influences that Modjeska makes reference to in her Acknowledgements. The book has been short-listed for many awards, including the Miles Franklin, and despite the Miles Franklin’s (sometimes disregarded) restriction to Australian works ‘in all their….’, this is very much a book about Australian colonialism as well. I’m not sure, though, that I was completely satisfied by the book. I recognize its depth and the importance of the ideas it carries but I don’t know if fictionalizing was a solution to the problem of how to represent them. This entry was posted in Australian Women Writers Challenge 2013, Australian Women's Writing, Book reviews, Miles Franklin Award 2013. Bookmark the permalink.